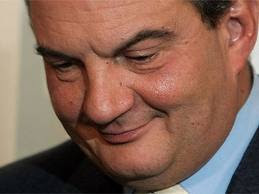 Citizens across Greece are still trying to come to grips with a classified document that come to light in the Thursday June 17, 2011 edition of Epikaira Magazine and which stated that “shady forces” were plotting the assassination of the former Prime Minister of Greece Costas Karamanlis. As a result of these revelations, a judicial investigation was launched last week by the Greek justice system and will now thoroughly investigate the documents at hand. Hellasfrappe says… It’s about time! The former prime minister, who was always a low-profile character, let it be understood through his colleagues that he desires that the investigation be kept away from the public scrutiny. The magazine said that the information in the controversial documents it featured contained intelligence reports from Russian sources, and in particular by a Russian officer who gave a detailed description of all the events and actions that occurred during that period under the title "Working Group" of the FSB (Russian secret services). The Russian officials uncovered the assassination plot codenamed “Pythia 1” part of a larger plan to destabilize the country, and, after analyzing the evidence, concluded that it was the brainchild of an allied country. More specifically, the planned assassination would be carried out by a "shady" team of individuals, and was directly linked to Karamanlis’s pro-energy policies and tight relations with Russia, which the west and other Greek allies did not approve of. Many members of his government knew about the plan and consider it to be a matter of national importance as well as describe it to be one of the biggest scandals since the restoration of democracy in Greece. More precisely, and according to the highly confidential document codenamed "Special Newsletter" (No. 219 / 5 February 2009), both the Prime Minister, the Minister and Deputy Interior ministers Prokopis Pavlopoulos and Christos Markogiannakis, respectively, were informed about the "Working Group’s" mission in Greece, as well as the fact that they had identified and revealed the plan of attack against the former PM in the framework of either postponing and/or cancelling "the energy policy of Greece." The silent, or as some term him, or the “mysterious” advisor to Prime Minister George Papandreou, and former formal advisor to the government of Georgia, Alex Rondos was also said to have known about the plot, and it was concluded that he in return informed Papandreou. On June 23, in a follow-up story, the Epikaira magazine stated that Rondos had apparently received notice of the Western plan that had as its goal the termination and/or delay of the South Stream gas pipeline, and part of this plan also included the assassination of Costas Karamanlis (noted in the classified document as ‘the target’). The Russian agents, who came to this conclusion, said the article, placed great importance on this last point in their report to the Greek secret services at the time noting that Papandreou knew of the plot’s existence via his silent adviser. Apart from the assassination of the former Prime Minister, and the destabilization of the country, the “Pythia 1” plot also had as its goal the political exploitation of the Vatopedi case, the attack on the Greek economy by successive downgrades, the kidnapping of some of the wealthiest businessmen in Greece and social unrest. The justice system will now investigate the case with the assistance of Greece’s National Intelligence Service and uncover if the act of high treason was committed.